On April 22, diners at Pasta Pomodoro in Voorhees (700 Haddonfield-Berlin Rd.) will be able to support the National Foundation for Celiac Awareness just by enjoying a fabulous gluten-free meal. From 5 p.m. to 9 p.m. that evening, the BYOB restaurant will be hosting a gluten-free dinner event and a portion of the proceeds will benefit the NFCA. Diners will be able to choose from Pasta Pomodoro's extensive gluten-free menu in its entirety - from garlic bread to pizza, from mozzarella sticks to tempting dessert selections. Reservations are a must, though, so call chef-owner Pasquale Masters at 856-296-1268 or email him with the time and number of your party. It's not the reunited Van Halen, but another tour will hit the Philadelphia area less than a week after the Pasta Pomodoro dinner. The Celiac Awareness Tour is a series of national events dedicated to providing education and entertainment for those on a gluten-free diet. On April 28, the Tour will be at the Crowne Plaza Valley Forge Hotel in King of Prussia (260 Mall Blvd.) 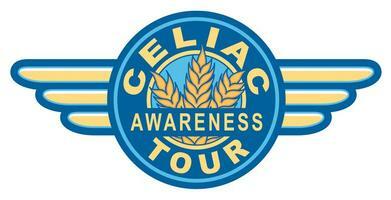 from 9 a.m. to 2 p.m. (Full disclosure: The Celiac Awareness Tour is an advertiser at the Gluten Free Philly blog.) Besides meeting medical experts, you can watch live cooking demonstrations on the Rudi's Gluten Free Bakery Stage and enjoy gluten-free food samples from dozens of local and national companies, including French Meadow Bakery, Nature's Path, Kinnikinnick, Food For Life, Glutino and Udi's Gluten Free Foods. Presenters include NFCA founder Alice Bast and local health coach Jennifer Fugo, and there will be raffles and prizes. I will be at the NFCA booth from 10 a.m. to 11 a.m. Through April 14, early-bird tickets can be purchased for $9 per person online; thereafter and at the door, it's $10. Kids under 12 are admitted free. I hope to see you at both events! I just made reservations for the April 22 dinner at Pomodoro!